The first thing that you will notice about the Hario Mini Slim Coffee Mill is that it is really small, or shall we say compact? This might seem a tad obvious for something that has the word ‘mini’ in it, but there, we said it. Standing at a diminutive eight inches tall, this isn’t so much a kitchen appliance, as something that is very, very portable – basically the size of a large pepper mill. 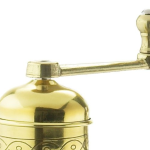 In fact, you can absolutely use it as a pepper mill, or spice mill, or coffee mill. That said, if you do decide to use it as a classy but small coffee mill, we are talking fairly small portions, at a fairly work-a-day pace, so keep that in mind. 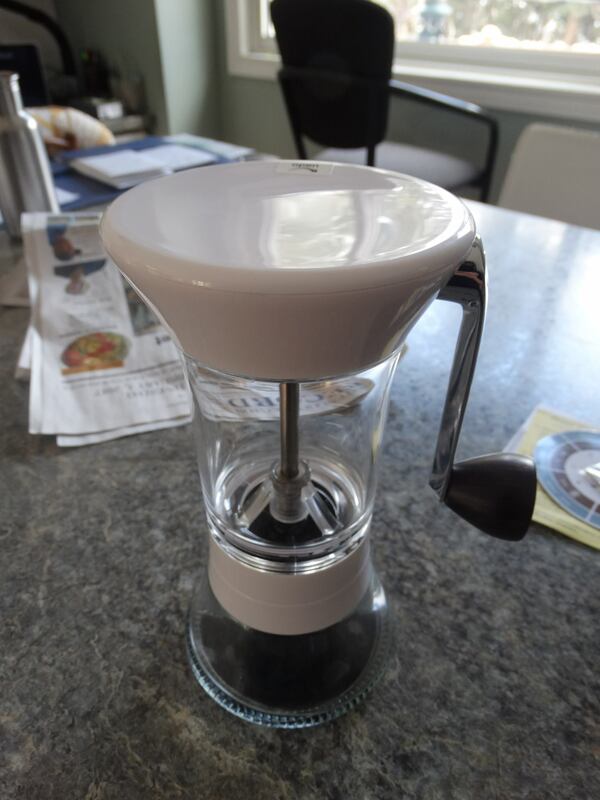 This isn’t called the Hario “Speedy” Mill. The Mini Slim is known for its style, and its portability, and it’s beauty (Hario makes glass), and not so much for the fact that it is a real bean grinding factory. Here’s a quick video review of the Hario Mini Slim Mill in all its glory, with a great explanation of how it should be used as well. 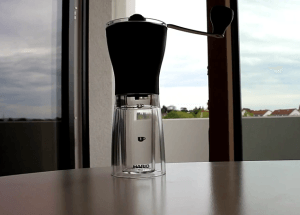 As you can see from this video, although the Hario Mini is small, it really isn’t that small. Its actually pretty big for a small grinder, if that makes any sense. It does about two cups, according to buyers of this product. It has been referred to as a “grind-as-you-go” type of grinder. Another thing that the above video shows is that this grinder requires you to give it your full attention while grinding. Its not in any way automatic, so you’ll be doing all the grinding. 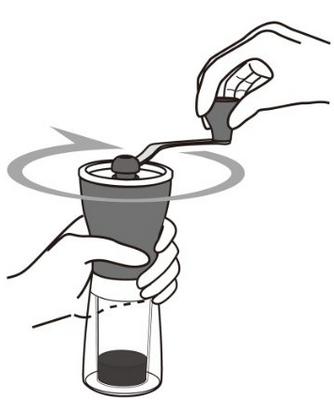 Once you’ve got the amount of coffee you want, its quick and easy to dispense those grinds into your porta-filter, or what-have-you. 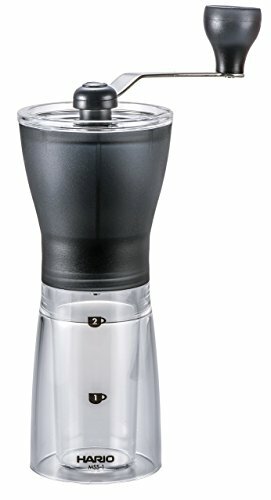 This coffee grinder is actually great for grinding right into an Aeropress, or French Press for that matter. In any case, the Hario Mini Slim isn’t meant to do the bulk of your coffee grinding, especially if you’re a coffee fiend who is brewing coffee morning, noon and night. 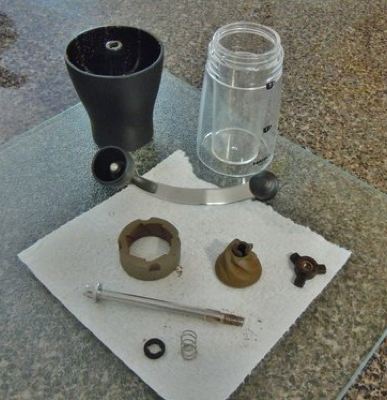 However, if you’re someone who travels a lot, and wants to bring a grinder with you to make a cup at the hotel, cottage, job, or whatever, then this might be perfect. 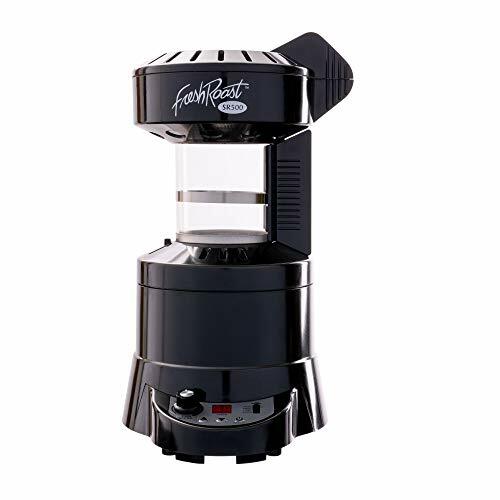 Camping is another popular way to put this coffee grinder to use. 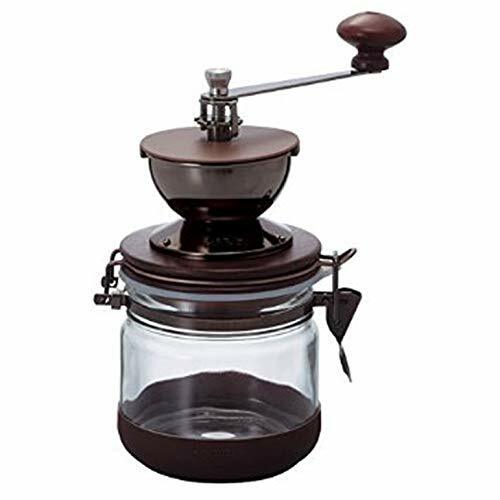 Hario do make several other hand held coffee grinders including the popular Skerton hand crank manual grinder, as well as the antique-y Hario Canister grinder. For those who don’t know, Hario is a Japanese company and they are famous for their glass-making, which is featured in many of their kitchen products, including their grinders. Pictured left is one of their fancy coffee devices. Glass isn’t their only specialty – as it so happens, coffee is right up there as well. Actually, the Hario Mini Slim Grinder is just part of the greater Hario “dynasty” if you will, it being the smallest member of the family. But never mind the size, what about the all important performance of the dinky Hario Slim Grinder Mini? Is it able to grind its competitors under the table, much in the same way as Danny Devito might win a drinking contest? As you may know, coffee lovers can be a fickle bunch, but with the Mini Slim, we are encouraged by reports that most coffee aficionados do seem to rate the consistency and texture of this little grinder highly. It can pull off a number of grind sizes, from coarse to fine. So clearly, size is not everything here. French Press grind? Sure! Drip coffee, also not a problem. 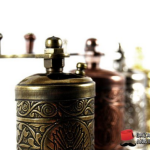 Even if you literally want to be able to grind into the dust required in order to make Turkish coffee, this is still an option. In terms of output, most users are reportedly happy with the overall finish that the Hario produces. Grind, crush and crank away to your heart – and your hand’s – content literally anywhere. Being off the grid, in a tent, cave or wherever should not be an obstacle to producing cafe quality fine grinds. 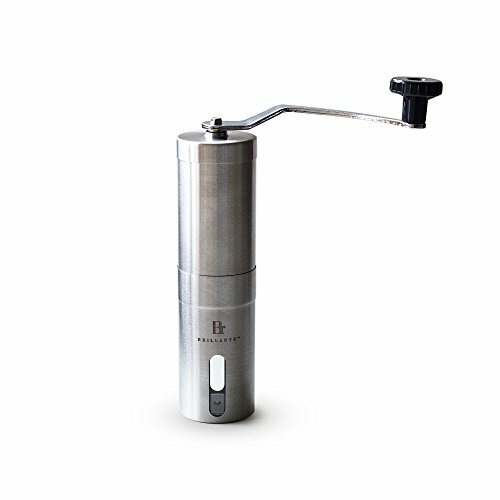 Situations that make you feel a bit like a hippy are common with the Hario Mini Slim Grinder. In terms of pricing, produce and portability, this is one of the best coffee mills for hand grinding that can be purchased today. This, at least, is the good news. It is unfortunately not all 100% sailing with the Hario Mini Slim Grinder. More on that in a minute. 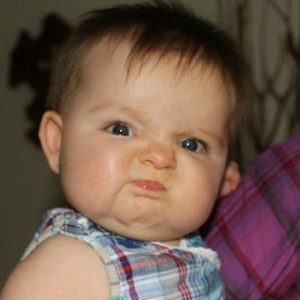 There are many positives that we should mention firstly, though, before we tear this sucker down. Namely, the price at around $20 and the smaller size. It is lightweight and highly portable. It grinds excellently. Every part of this grinder can be taken apart and washed and then reassembled fairly easily – ensuring a fresh and clean grind every time. It is solid and well made. Its easy to grind, unless you have no muscle mass at all. If you don’t, it will help you build it. It is, of course, small. 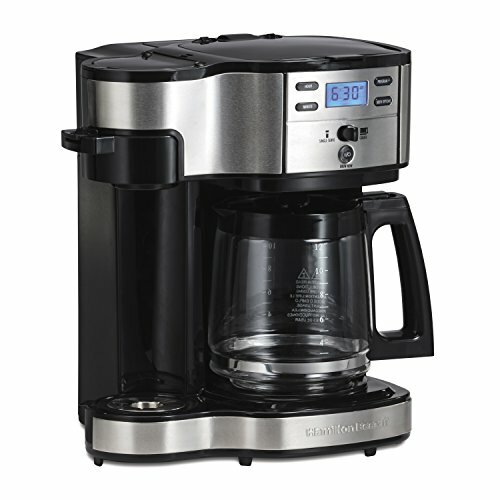 One should not be expecting to be able to crank up huge vats of coffee with it – you can produce enough for one good cup of coffee – maybe two – quite easily before getting RSI. But, if you must know, the main problem people have had with the Hario Mini Slim its longevity. It seems that this grinder, according to its enemies, just doesn’t have the lifespan of some grinders. Its sad, but it is there for anyone to see in places like the Amazon review page of this little bitty grinder. It should be remembered that the vast majority of people who bought this did not have this problem, with the vast majority of coffee fans giving it a solid 5 stars, but it is not without its detractors, that’s for sure. And it should also be noted that this was probably only ever intended as a supplemental grinder. 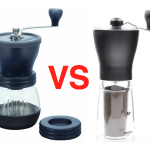 If you are using it every day, for every occasion, you might be better off getting a really good burr grinder. Check out our top 3 cost effective electric burr grinders over here to see what we’re referring to. 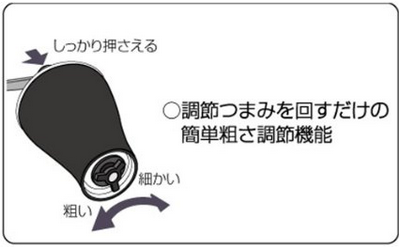 Also, available on the Hario website is an actual video demonstration of the Mini in action, which should clear up any confusion… as long as you are not relying on the translated directly from Japanese subtitles which –bafflingly – instruct the user to “put in the cover of shat”! 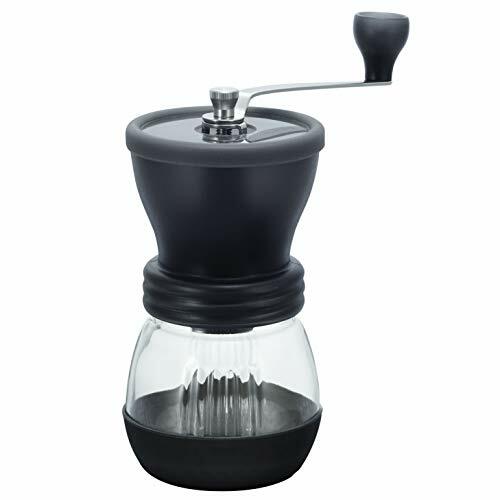 We do have a fondness for the Hario Mini Slim Coffee Mill, for the following reasons: its inexpensive, portable, lightweight, easy to clean, relatively quiet, produces Grade A coffee, has an adjustable burr set, and is aesthetically pleasing. 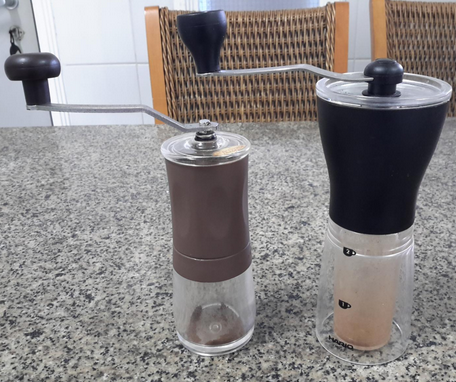 On the other hand, the downside to this grinder is that it is not very big, requires you to do all the work, and, for some, has been known to fall apart from time to time. 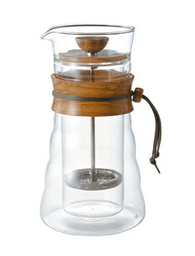 Still, we give the Hario Mini Slim Coffee Mill 4 STARS – Another great product from Hario! It’s a great grinder, producing a very consistent ground. I use it mainly for espresso at home (doesn’t wake the family) and when I travel, it’s a great for a fresh brew with my Aeropress. One thing when travelling was how to hold the hopper lid on (and avoiding beans going everywhere) was using a rubber bands, which often popped off. I got a 3D printer recently and figured and I could design a clip – and it works really well. The link from Thingiverse below shows my design – free for you to print!